The Shiites were demanding reforms to anti-Shiite practices that shut them out of top government employment and prevent them from building places of worship. Saudi Arabia's ruling family and the majority of the country are Sunni Muslims. Nimr was a bold voice for Saudi Shias. "From the moment you're born, you're surrounded by fear," he said in a 2011 sermon. "The people took to the streets demanding freedom, dignity and reform. We don't mind getting arrested with those who've been detained and we don't even mind shedding our blood for their sake." Less than a year later, Nimr was arrested, and shot and wounded in the process. Police claim he used violence against them; his supporters and family say that's not true. He was sentenced to death Wednesday on charges that include being disloyal to the ruling family, using violence and seeking foreign meddling. "This can end up festering over a long period of time and ultimately leads to instability," Coogle says. Coogle says the court that sentenced Nimr, a specialized criminal court, was originally formed to try terrorism cases but is now being used to silence critics. Nimr's nephew, an activist, was also sentenced to death in the same court. Human Rights Watch is calling for the court to be abolished. Coogle says western allies like the U.S. need to address Saudi Arabia's human rights record. "If we're going to support human rights in Syria, for example, it's also important to have conversations with our own ally," he says. In Saudi, small protests have begun. In the eastern province of Qatif, home to a large part of Saudi's Shiite community, protesters called for the downfall of the ruling family. 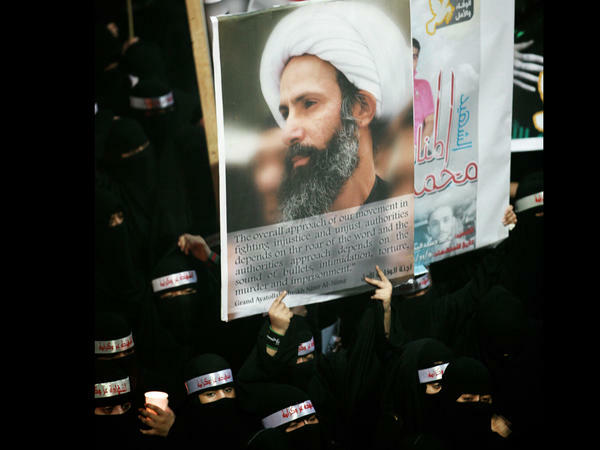 If Nimr is killed, activists warn, the unrest will grow. In Saudi Arabia, protests have broken out in the east of the country over the death sentence of a leading Shiite cleric there. Human rights activists call his sentencing political and warn that by killing him the country may deepen sectarian discord. NPR's Leila Fadel sent this report. LEILA FADEL, BYLINE: Sheik Nimr al-Nimr was a leading voice during protests in 2011 and 2012 mainly by the minority Shiite Muslim community. They were demanding reforms to anti-Shiite practices that shut them out of top government employment and prevent them from building places of worship. The ruling family and the majority of the country are Sunni Muslims. Nimr was a bold voice for Saudi's Shiites. NIMR AL-NIMR: (Speaking foreign language). FADEL: In a sermon in 2011 he says, from the moment you're born you're surrounded by fear. The people took to the streets demanding freedom, dignity, and reform. We don't mind getting arrested with those who've been detained and we don't even mind shedding our blood for their sake. Less than a year later, Nimr was arrested and shot and wounded in the process. Police claim he used violence against them. His supporters and family say it's not true. This week, he was sentenced to death on charges that include being disloyal to the ruling family, using violence and seeking foreign meddling. Human Rights Watch researcher Adam Coogle says the sentencing was political. ADAM COOGLE: This can end up festering over a long period of time and ultimately leads to instability. FADEL: Coogle says the court used to sentence Nimr, the specialized criminal court, was originally formed to try terrorism cases but is being used to silence critics. Nimr's nephew and activist was also sentenced to death in the same court and Human Rights Watch is calling for the court to be abolished. Coogle says Western allies like the U.S. need to address Saudi Arabia's human rights record. COOGLE: If we're going to support, you know, human rights in Syria, for example, it's also important for us to have serious conversations with our own ally. FADEL: In Saudi, small protests have begun. FADEL: Here, in the YouTube video allegedly filmed in the Eastern Province of Qatif, home to a large part of Saudi's Shiite community, protesters call for the downfall of the ruling family. And if Nimr is killed, activists warn, the unrest will grow. Leila Fadel, NPR News, Cairo. Transcript provided by NPR, Copyright NPR.